In 1980 an average property in London cost £24,000. Year by year, the price increased in an average rhythm of 7%. The same type of property now costs £223,257. The price multiplied by almost 9.5 times. How about affordability among people living in the UK? The rise in the property price should have been alright and easy to handle if the earnings rose proportionally. Unfortunately, this was not the case. 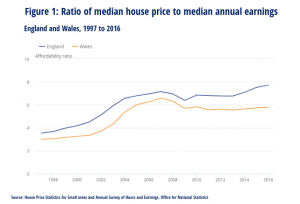 In the last decade, median individual annual earnings in Britain rose by 68%, whilst the house prices grew by 259%. The inequity is the real gap between generations. The complete study and a very efficient analysis you can find on Property Division.